Mahabharat has inspired bollywood. A number of hindi movies are based on this epic and rightly so, because no other epic provides the depth and variety as this does. There are a number of films and serials which have been made on Mahabharat story and in recent times, we see a modernised version of Mahabharat where the story line is inspired by Mahabharat. Probably, the first movie based on Mahabharat was A Throw of Dice (Prapancha Pash 1929). This was based on myths and legends drawn from Indian epic Mahabharat. Charu roy and Sita devi were the characters of this film. This was directed by a german filmmaker Franz Osten. This same gentleman has directed the landmark hindi movie, Acchut kanya. 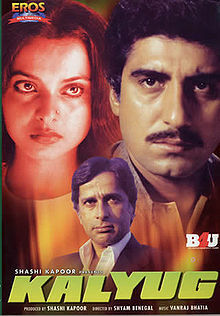 Kalyug – Many people perhaps struggle in remembering this hindi movie, but I reckon this was a commendable effort with actors related to art films. Victor Banerjee played the role of Duryodhana and Yudhisthir was played by Raj Babbar. Though the movie was based on modern times, one can easily relate to the characters. This was directed by Shyam Benegal. Rajneeti – This is quite recent and the story line appears to be inspired by Mahabharat and The Godfather, a famous novel by Mario Pujo. Ajay Devgan has played Suraj which is Karna in Mahabharat. Manoj Bajpai admirably plays Duryodhana. There is Nana Patekar as Brijgopal or Shri Krishna and Ranvir Kapoor plays the role of Arjuna and Michael Corleone. The story is inspired by The Godfather here, where the elder brother of Ranveer, Arjun Rampal dies in the movie. This is more like Sonny Corleone. Nevertheless, a good attempt, but the surprise factor was not there. To read more about Rajneeti, the hindi movie, visit here. 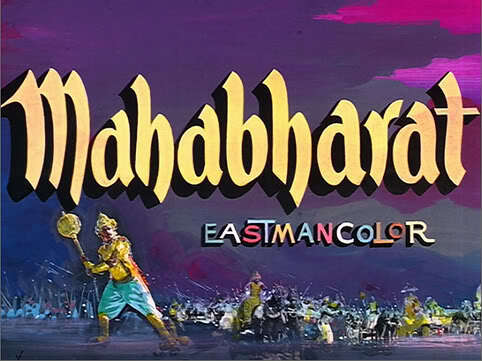 Mahabharat – This hindi movie was made in 1965 with the same name as of this epic. Dara Singh played the role of Bhima. 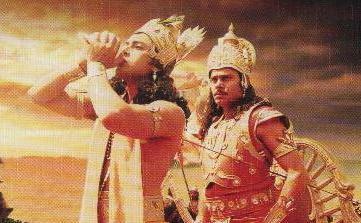 Abhi bhattacharya as Krishna and most appropriately, Jeevan played Shakuni. We don’t know much about how did this movie fared, perhaps you can help by giving your feedback through comments. Mahabharat, the serial: In 1988, BR Chopra, the famous director – producer of Waqt fame, did a fantastic job of telling this epic. So beautifully this serial was made, that people used to wait in anticipation. The streets were deserted when this serial was aired on sunday mornings. Dara Singh played a brief cameo of Hanuman. Shri Krishna’s character was made his own by Nitish. Mukesh Khanna is also remembered fondly for his role played as Bhishma Pitamah.